A flat feels like home, if one feels comfortable and safe living there. As a state-owned company, that is what we stand up for since our formation, with fair rents, comprehensive tenant services around the clock, as well as with a wide variety of rental objects. We always keep the utility bills in mind too: We are negotiating perseveringly with utility providers, to minimize the burden of utility bills for you. We place our tenants centre stage! No matter whether you are looking for a flat or whether you already live with us - we do our best to fulfill your wishes and needs. This may be one of the reasons why 28,444 tenants and their families already enjoy living at our flats. Anyone is welcome to us: Whether single, student, senior, couple or family - anyone can find a flat, which fits their needs and yet remains affordable. berlinovo setzt sich für bezahlbaren Wohnraum ein, damit die berlintypische Durchmischung der Bestände auch weiterhin aufrechterhalten wird. Dies betrachten wir als unseren Beitrag dafür, dass sich auch in Zukunft sozial schwächere Menschen noch ein Wohnen in der Innenstadt leisten können. Wir wurden von ImmobilienScout24, der größten Plattform für Immobilien, als "Premium Partner" ausgezeichnet. Diese Auszeichnung wird nur an Immobilienunternehmen vergeben, die sich durch langjährige Markterfahrung und herausragende Kundenorientierung bewiesen haben. Wir wurden dabei von unseren Kunden empfohlen und erreichten damit im Vergleich zu unseren Mitbewerbern eine überdurchschnittliche Bewertung. 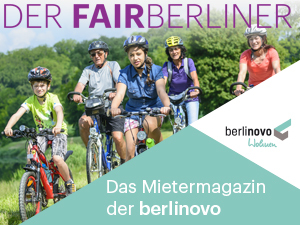 berlinovo is now partnering with FAIR-MIET-SALON, an event series organised by the Berlin club AusserGewöhnlich. On the 26th November, politicians, housing providers, investors, and tenants met once again to discuss the Berlin housing market. Campaign BERLINOVO WOHNEN. EINFACH FAIR. We are a large nationwide housing provider, and the interests of our tenants always take priority. In order to further emphasize our main priority, we have created the sub-brand berlinovo WOHNEN. Read more about Campaign BERLINOVO WOHNEN. EINFACH FAIR. The first month's rent is on the house! You're going to enjoy studying this offer: If you sign a rental agreement for one of berlinovo's student flats in Cottbus before 6 June 2013, your first month will be rent free (utilities and other regular overhead costs will have to be paid; this offer is for students only).